"Damage observed on the forward fuselage and cockpit section of the aircraft appears to indicate that there were impacts from a large number of high energy objects from outside the aircraft. The preliminary findings failed to name a perpetrator. The full report will be out sometime in mid 2015. You don't need a PhD in the Obvious to grasp one interpretation of this finding. There was no mention of a missile, just " high-energy objects from outside the aircraft." That sounds like the "30 millimeter caliber projectiles" or similar projectiles fired from " the cannon of a fighter aircraft. It could be something else but the photograph and finding are compelling evidence. In addition, there is no mention of a missile bringing down the aircraft. Therefore, the resistance militias maligned with the presumption of guilt by the White House and its chorus in the European Union seems to be off the hook. Since the photograph that Haisenko used was published right after the crash, the resistance should have been removed from the suspect list at that time. 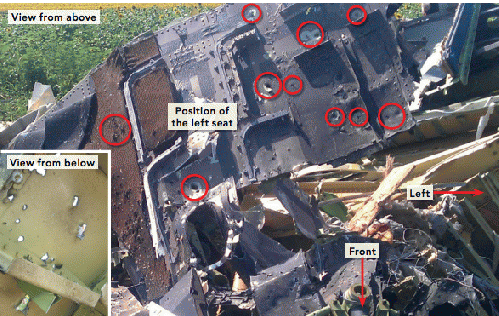 Haisenko analysis was available on July 1, based on direct photographic evidence from the scene, a photograph of the cockpit area of MH17. The safety board noted that they didn't go onsite to the crash due to fears about safety. Hence, their observation of evidence was similar, albeit more extensive, than Haisenko's. Kevin Zuesse wrote an extensive article on the German pilot's theory on July 31. Zuesse also reported on a secret agreement to keep the findings within a chosen circle including the United States, European Union, and Ukraine government. We have no flight recorder tape to hear. We don't have tapes from the Ukraine air traffic control. If fact, we just have what the US-EU alliance chooses to give us. The report doesn't name a perpetrator. However, it casts doubt on the rapid and highly damaging blame assigned to the eastern Ukraine resistance. The relentless campaign for hostilities against Russia and support of a neo-Nazi regime in Ukraine is based on proof that was never there. All the US and EU officials had to do was what Peter Haisenko did: look at the picture of the cockpit and start from there. N.B. There are arguments that the Dutch report may still indicate a missile attack. In point of fact, it was essential that the report not exclude a missile. Excluding a missile would have excluded entirely the resistance since they have no planes and pointed directly at the Ukraine military. Nevertheless, we have the explanation by Peter Haisenko in his July 1 analysis. Haisenko goes into some detail to explain why the evidence from the high resolution image of the crash argues against the claim that a missile brought down MH17.